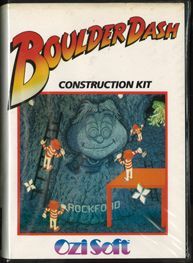 Boulder Dash ® is a classic video game starring Rockford™, famous for his blinking eyes and foot tapping. Once you are hooked, you keep coming back to this game for more, it’s so much fun, easy to learn; but, difficult to master! In 2011 Boulder Dash became part of the Smithsonian’s Exhibit: “The Art of Videogames”! Created by Peter Liepa with Chris Gray, two Canadians, Boulder Dash ® was initially published by New York publisher, First Star Software, Inc. The unfinished game was submitted to First Star Software, Inc. as well as all of the other major publishers of that era. It just so happened that the submission disk was opened by Richard M. Spitalny, a co-founder and the president of First Star Software, Inc. He was the first one at the company to play the game and, though unfinished, he was immediately struck by the game’s deceptive simplicity. He was hooked almost immediately! Though the graphics were a bit blocky, the caves were easy to navigate due to the excellent joystick controls and they ramped up in difficulty at just the right pace. He quickly felt that even though he might fail at clearing a given cave it was due to his mistakes rather than things speeding up which was a common way to increase difficulty back in 1983. He quickly struck a deal with Peter Liepa; and, on October 28, 1983, First Star Software, Inc. purchased all rights to the Boulder Dash ® intellectual property in return for an advance against on-going royalty participation by Peter and Chris. Richard and Peter also agreed to make some slight, but significant changes, such as increasing the number of color pallets as well as the introduction of small, non-scrolling, caves to be inserted every four caves as bonus levels. It has since become one of the longest ever running franchises in computer gaming as it celebrates its 35 anniversary in 2019! The gamer was enabled with the ability to grab, push, or dig from a stationary position in order to more easily collect diamonds while avoiding enemies or falling boulders, a feature that really added to the excitement of the game. 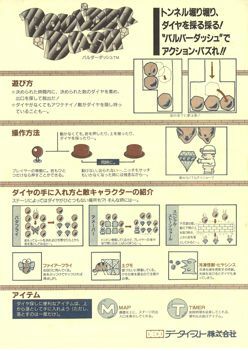 Additionally, when positioning boulders so that they fell through magic walls, the boulders would turn into diamonds. When boulders fell on Fireflies, the Fireflies exploded barriers. If Butterflies were likewise killed by falling boulders, they too exploded, each turning into as many as 9 diamonds! The ever growing Amoeba, another in-game enemy, if not completely surrounded in time, turned entirely into boulders. But, if fully surrounded in time, an Amoeba turned entirely into diamonds! 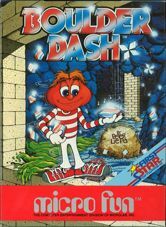 Boulder Dash’s success truly started with the release of the Atari version, generating rapid growth also helped by magazines praising it. It was named “Game of the Year” by Personal Computer; “Atari Computer Program of The Year” by “Computer Entertainer”. Family Computing awarded it “Arcade Game of The Year”; and, Zzap Magazine”, with permission from First Star Software, Inc., even made the Rockford character their mascot, as he made regular yet random appearances in the magazine. 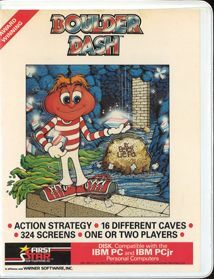 After its initial success on the Atari 400/800 computers, Boulder Dash® was published on other gaming platforms such as the Commodore 64, Apple II, IBM PC jr., then achieving great success across Europe and in Japan as well as North America. 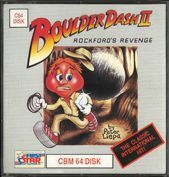 Boulder Dash ® II, or Rockford’s Revenge™, was the first sequel in the series. While the sequel’s general game layout was very similar to the original, it included new elements. For example, certain walls expanded horizontally when they were dug out; and, blue slime was introduced which would briefly slow down falling rocks and diamonds, until they fell through it. 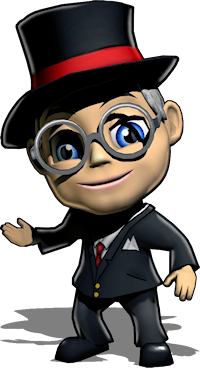 A Boulder Dash ® clone was created by “American Action”, a Swedish outfit, that they called Boulder Dash ® III. In an ill-advised deal, First Star Software, Inc. granted American Action an official license after being paid advance royalties. Things turned sour when the “space-themed” visuals American Action planned for led to a host of bugs making some levels impossible to complete; short-term commercial objectives seem to have rushed the developers. First Star Software, Inc., however, averted permanent damage to the brand with the release of Boulder Dash ® – The Construction Kit™. Some were worried about offering an editor allowing fans to create their own games. However, since gamers could easily exchange cave levels created by them, the Boulder Dash® brand and the game’ popularity kept getting stronger. Other software companies followed suit releasing three additional coin-operated versions of Boulder Dash ®. Data East released two coin-operated arcade versions; and, Mastertronic’s Arcadia Systems division commissioned a coin-operated game entitled Rockford™. 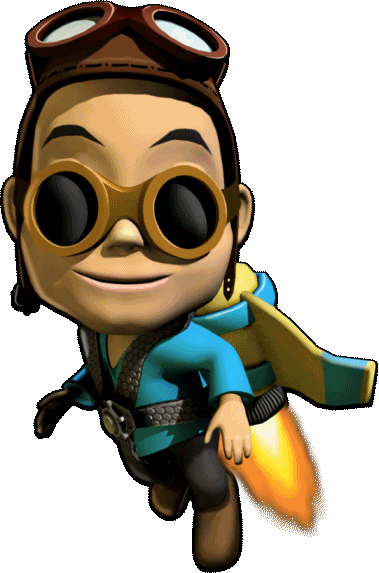 The game’s development was headed by Fernando Herrera, one of First Star Software’s co-founders and the author of the company’s first game: Astro Chase™ as well as its third game, Bristles™. Many of the caves in Rockford were designed by Fernando. Peter Liepa designed some of the caves for this game as well. The original arcade version of Rockford ran on the “Arcadia Multi Select System,” a Commodore Amiga 500-based system that could support multiple games. 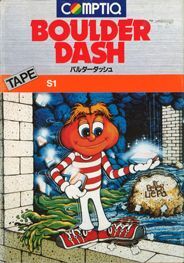 Data East also released Boulder Dash® on the NES (Nintendo Entertainment System) in Japan; JVC published versions for NES and Gameboy in North American and Kemco published a version on the Game Boy Advance. The leaderboards of Boulder Dash ® – Treasure Pleasure™ and Boulder Dash® – Pirates Quest™ for PC increasingly showed women as top scorers, leading to a big change in the game – the introduction of Crystal™. A female character players could select if they didn’t want to play as Rockford! Many find it amazing that the game is still alive and thriving 35 years later and a excited when they discover versions available for various game consoles, hand-held platforms; SmartPhones as well as for PCs and Macs. For example, Boulder Dash ® XL™ is on Xbox 360 with stunning graphics, enhancing the game and keeping its look and feel up-to-date without losing the original feel. Others say that the Atari 2600 version is the best version ever. 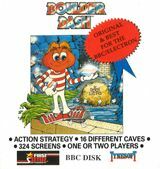 Mid of 2017 BBG Entertainment GmbH acquired all rights to Boulder Dash from First Star Software Inc.
Boulder Dash I (1984 – Apple II, C64, Atari400/800, PC,…) – the first version called Boulder Dash I (or Boulder Dash Vol. 1) was published by First Star Software on the Apple II, C64, Atari 400/800 and PC. This first version was also offered for the European Amstrad CPC, BBC-Electron and ZX Spectrum home computers. In Japan it was published by Comptique for NEC, Fujitsu and MSX (Japanese home computer standard) computer. 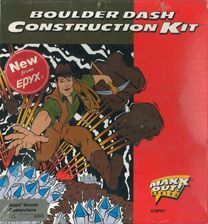 Boulder Dash I (1984 – Arcade) – The coin-op company Exidy licensed Boulder Dash I and ported it to their Max-A-Flex arcade cabinet. This was the first time home a computer game was licensed into the arcades, rather than the other way around which was the norm. 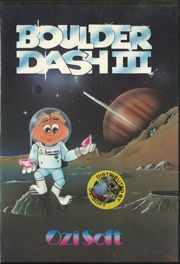 Boulder Dash I (1985 – Arcade) – in 1985 another arcade company (Data East) released it on their “DECO Cassette System”. 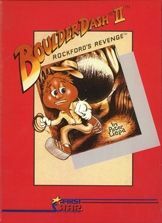 Boulder Dash II – Rockford’s Revenge (1985 – Apple II, C64, Atari400/800, PC,….) – the second version of the game was published by Electronic Arts (EA) on the Apple II, C64, Atari 400/800 and PC. In Europe it was also released for Amstrad, MSX and ZX Spectrum. Prism Leisure published it under the name Rockford’s Riot on the ZX Spectrum. 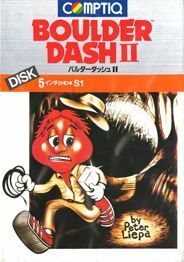 In Japan this version was titled Champion Boulder Dash and was released for MSX home computers. 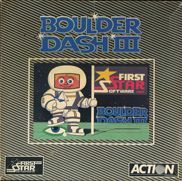 Boulder Dash III (1986 – Apple II, C64, Spectrum, PC) – special monochrome version with space-themed graphics. 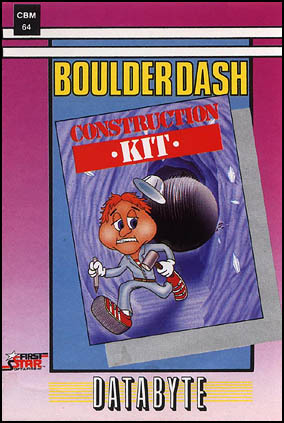 Boulder Dash Construction Kit (1986/1987 – Apple II, C64/C128, Amiga, Spectrum, Atari 8-bit computers, Atari ST, PC,…) – this version was published by Prism Leisure (UK) and EPYX (US) and was first offered in Europe and later in 1987 in the US. It was also titled Boulder Dash IV. The construction kit allowed players to create their own levels. 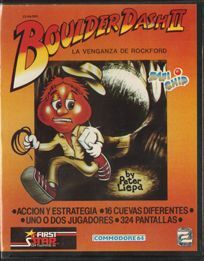 Rockford (1988 – Arcade, Amiga, Atari 8-bit, Atari ST, Arcade, Spectrum, Amstrad, C64) – The Boulder Dash sequel called Rockford™ was created for Mastertronics who released the game worldwide across numerous home computer platforms as well as into the coin-op arcades. Rockford was released by Mastertronics for: Amiga, Amstrad, Atari 8-bit, Atari ST, C-64/128, Coin-Op, PC and Spectrum. It was distributed in North America by Electronic Arts. Boulder Dash Part 2 (1990 – Arcade) – Data East developed and distributed the 4th coin-op version of Boulder Dash. This was the second Boulder Dash coin-op version licensed by them from First Star Software. 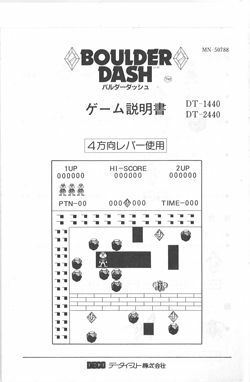 Boulder Dash (1990 – Game Boy and NES) – JVC got a license and published the Game Boy version in North America and Japan and the NES version in North America. JVC sub-licensed these versions to Nintendo and Nintendo published them in Europe. Data East published the NES version in Japan. Boulder Dash I (2001 – Java Cell Phones) – Boulder Dash I was ported to Japanese Java cell phones. Boulder Dash EX (2002 – Game Boy Advance) – Kemco in Japan developed and sold this version (Japan, North America and Europe) which includes a new “EX mode” including multi player feature and the “Classic mode” which is a direct port of the 1984 PC version. Boulder Dash: Rocks! (2007 – DS, PSP) – was published by Electronic Arts (EA) in Europe only. 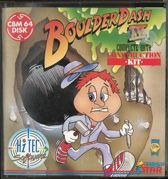 Boulder Dash Vol 1 (2008/2009 – WiiWare Virtual Console) – the original C64 version was released on the Virtual Console for C64 in Europe and later in North America. Boulder Dash-XL (2011 – Xbox Live Arcade, Windows PC) – in partnership with Kalypso and Catnip Games feature both Rockford™ and Crystal™ in over 150 all new caves, across 5 Game Modes.Videogames”. Boulder Dash-XL 3D (2012 – Nintendo 3DS) – 3D port of Boulder Dash-XL for Nintendo’s 3DS was released at retail in Europe and North America in 2012 and on Nintendo’s eShop (including Japan) in 2013. Boulder Dash-XL (2012/2013 – iOS, Android) – remake of the classic Boulder Dash done by Hero Craft Ltd. with new graphics and levels for iOS and Android. 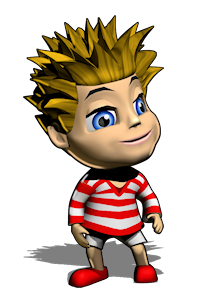 Boulder Dash-The FULL Collection (2013 – Android) – this Android SmartPhone version was a launch title on GameStick in 2013; soon thereafter released on OUYA. Boulder Dash: 30th Anniversary (2014 – iOS and Android) – featured by Apple in Best New Games in mid October, quickly moving into the Top 50 for Free Puzzle Games. Soon thereafter released for Android. This version includes 260 exciting levels, 13 new, gorgeous worlds, and 10 playable characters..
Boulder Dash: 30th Anniversary (2016 – PC and Mac) – the first sequel since 1987 to include an editor, allowing users to create and share their own caves on Steam Workshop! The original Boulder Dash® was created by Peter Liepa with Chris Gray over 30 years ago. 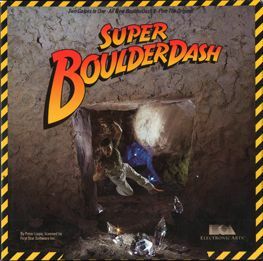 Boulder Dash®-30th Anniversary™ is the first, and only, game in the Boulder Dash series to include both a premium world designed by Peter Liepa and another by Chris Gray. While providing classic Boulder Dash core gameplay mechanics and features, Boulder Dash®-30th Anniversary™ introduces exciting new elements such as ramps with diagonal movement, which opens up new and intriguing puzzles while creating a very different and organic look for the caves.